I made a very cool and very Japanese/Macrobiotic dinner last night in an attempt to declutter my kitchen and use up pantry items. I started with this Soba Noodle & Umeboshi Dressing recipe that I’ve been obsessed with, but I had to make a few adjustments. 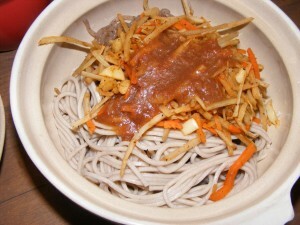 This was soba noodles topped with julienned burdock and carrot (frozen). I had a few shirataki noodles for bulk, but it was mostly soba. 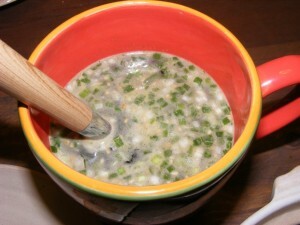 Then I made miso soup for each of us (from a packet, but again… trying to use up pantry items). 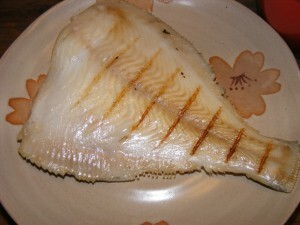 And I also grilled some frozen Rex Sole that I’d gotten at the Korean grocery a few weeks ago. The sole was actually really delicious (I ate my whole piece plus part of Bobby’s – he’s not really a whitefish person) and now I want to buy more of it. So that was a fail at pantry cleaning (unless I resist the temptation to buy more). I’ve actually managed to use up some other pantry items – I made chocolate/raisin/sunflower seed/oatmeal cookies for bobby (oatmeal raisin is his favorite) with the rest of my instant oatmeal (it’s sweetened, and I just can’t deal with that much sugar… I tried), nuts that I never eat, and raisins and chocolate that have been waiting to be cooked. He took them to work with him so they’ll probably disappear soon. I also sent him in to work with a big bag of granola bars so he’s going to try to have them for snacks. I’m totally over bars, and have been for a while. Just not my thing. The point of cleaning out the pantry is to use up all those things that I bought at one point and then discovered that I didn’t really like, or didn’t like as much as I thought I had. I’m making good progress I think. By the end of the month a decent amount of the excess food will be used up. My mom comes tomorrow night! I can’t wait to make her eat green oatmeal and kabocha. Have you ever made your parents try something that they thought was kind of crazy? (my brother also thinks my food is GROSS) his diet is DEFINATELY S.A.D. GREAT job on your pantry clearing… I am have FUN with that too. Feels good doesn’t it! Mmm, that dinner looks so deliciuos! I’ll have to see if they have miso in a packet by me, never thought of that! I’m not really a bar person either – just not my thing. I like dried fruit and nuts, occasionally, but usually I’m more of a fresh fruit snacker. I love finding recipes for random things in my kitchen! So much tastiness. I’m not a bar person but yesterday I MADE bars (recipe from The Denim Diet), and they’re fantastic. good job on the pantry cleaning out (i am going to attempt this later this week by making some cookies as well! ), and the not going to bed feeling yicky! off to a great start this week. I’m glad to hear that your nightly stomach problems are getting better! That dinner does look well-balanced and delicious. The challenge is definitely doing you good because it looks like you’re making lots of progress with the pantry items too. So glad that you have exciting plans for the summer. I would love to teach, and hopefully will be able to TA in the fall. My mom is quite picky, and sometimes refuses to eat my “super healthy” foods ;). But, she does share a daily bowl of oats with me. I’m hesitant to try green oats because I don’t want to scare her away from a healthy habit! I know how you feel about bars. I’d rather eat real food than a a lot of calories smooshed into a rectangular shape! I shared some raw donut holes with my parents, who loved them. But then, what’s not to love? I’ve never tried Japanese food…what is wrong with me??! You’re making so much progress, and you dinner looked delicious…especially that grilled fish. When I first started eating more of a vegetarian diet, I attmepted an all Indian meal with tofu for my parents. I have never cooked with tofu before and didn’t press the water out or anything. My dad asked me what all these big boogers were on his plate. Classy, huh? Yay i’m so happy your summer schedge worked out!! Good work with the cleaning out and NON sick feeling 😀 I still need to jump on the Kabocha bandwagon! I love Japanese food. Your meal sounds great! I’ve never tried burdock. I love how diverse your cooking is! Good for you girl! Yes, I have tried to make my parents eat just healthier in general-but they can be stubborn! yay! great job on eating comfortably before sleep! My parents always thought me eating oatmeal was crazy. I buy these bulk oats from Costco, and they always thought my obsession for oats is weird. But when I went to Singapore, they HAD to eat my oats to finish them off, and they fell in love with it! Now they must have it every morning…but of course, them being my Asian parents, they eat it with kimchi. urgh. it sounds that your cleaning pantry challenge is going well… i’m proud to say that I’m doing well too! 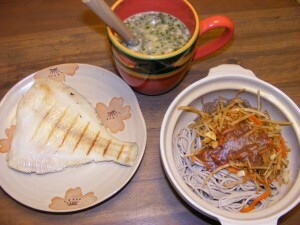 your macrobiotic/japanese dinner sounds delicious.. i wish I could be your guest to try that dinner combo! hope you’re having great time with your mom! 🙂 I made my parents to try my thing… but I doubt they really like it, because they’re used to stronger flavors and my foods are usually tasteless for them! I love Japanese food and I love white fish. I wish my husband was more of a fish guy. It all looks so good!